Murray David Publishing Australian History Series, 2011.. Reprint Edition; 4to; pp. 32; numerous illustrations many b/w. photograph illustrations, colour illustrations; maps; index; stiff illustrated wrapper; a fine copy. Aboriginal Use Of Water-Related Resources. n.p. n.d.. 4to; pp. 16; b/w illustrations; stiff stapled illustrated wrapper, a fine copy. Aboriginal use of Water Resources. n.p. n.d.. 4to; pp. 9; pages stapled at corner; paper wrapper, stain to back wrapper, otherwise a fine copy. My Hobby is Trout Fishing. Melbourne, J. T. Picken & Sons, 1946.. First Edition; 8vo; pp. 76; original red cloth, title lettered in gilt on front, bright gilt illustration to front board, browned endpapers, authors inscription on front free endpaper and signature, very good copy. 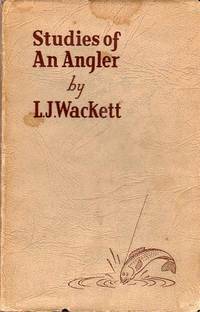 One of the rarities of Australian angling literature. 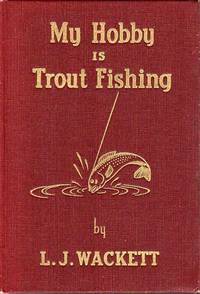 Includes chapters on how to fish for trout, useful hints, making trout files and thread line fishing. First edition; 8vo; pp. xii, 235; 3 colour plates, 3 b/w plates, diagrams and figures, technical appendix, index, dustjacket with two stains to front, dustjacket chipped with some disclouration, spine and corners bumped, previous owner's name on front free endpaper, good copy. Melbourne, J. T. Picken & Sons Pty. Ltd., 1950. Inscribed and signed by the author. Wildflower Diary. : A memorial volume compiled from articles published in the 'Junior Age' during the period 1960-64. Victoria, Native Plants Preservation Society of Victoria, (1976). . 8vo; pp. x, 150; frontispiece, profuse illustrations throughout, list of further reading, index, original cloth, light scuffing to dustjacket, spine also chipped and has a 5mm closed tear, otherwise a very good copy. Wildflower Diary. : A memorial volume compiled from articles published in the 'Junior Age' during the period 1960-64. Edited by Jean Galbraith. Illustrated by Elizabeth Cochrane. 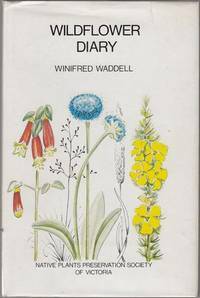 (Victoria), The Native Plants Preservation Society of Victoria, (1976). . 8vo; pp. x 150; illustrated frontispiece, profusely illustrated throughout, index; original stiff illustrated wrapper; marks to wrapper; page edges browned; otherwise a very good copy. The Buddhism Of Tibet Or Lamaism. : With Its Mystic Cults, Symbolism And Mythology, And Its Relation To Indian Buddhism. Cambridge, W. Heffer & Sons, 1958. Second Edition; 8vo; pp. li, 598; frontispiece; 7 plates, numerous illustrations within Text [approx 150]; Index; Notes On Pronunciation, list of abbreviations, title and illustrations in green on front board and spine; appendices of chronological table and bibliography; no dustjacket, small mark to rear board perhaps slight bumps to corners and edges, top of pages slight darker, light spotting to endpapers; a very good copy. Illustrations include the Eucharist of Tibet, Lama worship, the wheel of life, Lhasa and its Cathedral, black hat devil dancer and many more. Chapters cover Historical, Monastic, Mythology and Gods, Ceylonese Buddhism, Funeral rites, Nirvava, Svastika, Ritual and Sorcery, Festivals and Plays and more. The Raven Miscellany The Abbe Prevost. : A Play. Limited Edition; 8vo; pp. (viii), 60 (3 unpaginated); frontispiece; chipped dustjacket with 25mm and 14mm tear to front of jacket, price clipped, minor flecking to edges of cloth, minor flecking to bottom of page edges, a good copy. London, Constable And Company Limited, (1933). A limited edition of seven hundred and fifty copies printed for Constatble And Company Limited at the Raven Press in Harrow Weald Middlesex May 1933. The frontispiece was engraved by Horace Walter Bray. (London), The Society for Theatre Research, 1983. 8vo; pp. x, 54; 8 pages b/w plates, notes, index; stiff wrapper, a very good copy. Developments In The Benko Gambit 1981-86.: 100 selecteed games with annotations. First Edition; 8vo; pp. 35; diagrams, index of players, original illustrated stiff stapled wrappers, very good copy. London, Robert G Wade, n.d. (c-1986). Chess Tactics For Beginners. : Small 8vo; pp. 128; diagrams, original cloth, dustjacket, New York, Sterling Publishing, 1961. WADE, R. G.; BOTT, RAYMOND. ; MORRISON, STANLEY. ..highly organized and simplified explanation of some of the most powerfull weapons in the chessplayer's arsenal..."
California, Wilshire Book Company, 1976.. 8vo; pp. 288 (viii); diagrams, appendix; original stiff illustrated wrapper; worn and faded; otherwise a very good copy. WADE, R. G; HARDING, T. D.
8vo; pp. iv, 256; diagrams, index of complete games, index of variations and classification system, original cloth, dustwrapper. London, Batsford, 1974. Part of the Batsford's " Contemporary Chess Openings ", provides a comprehensive repertoire for Black against the Ruy Lopez. Has a minor water stain to the margin of the first few pages. Plan Of The Township Of Hamilton Situate On The Grange Burn. : Introduction by Gordon and Judith Scurfield, Foreword by Russell Worland. WADE, HENRY; ROSS, A. M.
Hamilton, Bellcourt, (1995). . 8vo; pp. (viii), 56, portrait frontispiece, first 54 pages are an introduction to the plan of Hamilton, fold out plant 50cm by 66.5cm, sources, appendices, index of names; original grey cloth, dustjacket, bookplate, pages uncut, a fine copy. This Edition of the Plan of the Township of Hamilton is limited to 200 copies. This is No. 36. Plan originally published in 1853. The World Chess Championship Botvinnik To Kasparov. WADE, R G ; KEENE, R D ; WHITELEY, A J.
London, B. T. Batsford Ltd., (1986).. 8vo; pp. (iv), 298; diagrams, index of openings; stiff illustrated wrapper; browning to pages, wear and marks to wrapper, a good copy. Air - Raid Shelters of World War II. 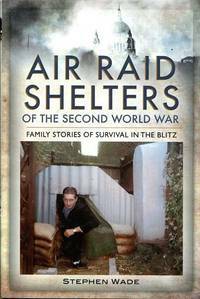 : Family Stories of Survival in the Blitz. (Barnsley), Remember When, (2011). . First Edition; 8vo; pp. xvi, 192; numerous b/w illustrations; afterword, thanks and acknowledgements, bibliography, index; dustjacket; a fine copy. The World's Great Railway Journeys. : travelling by locomotive through history and around the world. (Oxford), Sebastian Kelly. n.d. c. 1999.. 4to; pp. 256; colour frontispiece, numerous colour illustrations, acknowledgements and contributers, index; stiff sillustrated wrapper, fine copy. 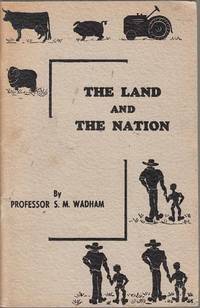 The Land And The Nation. (Melbourne, Stockdale Press, circa 1943).. 8vo; pp. 100; illustrated; stiff illustrated wrapper; bookplate; a good copy. A Wartime publication. WADHAM, SAMUEL; WILSON, KENT; WOOD, JOYCE. 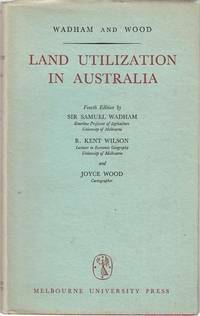 Melbourne University Press, (1964).. Fourth Revised Edition; 8vo; pp. xv, 295; map endpapers, 48 b/w plates, b/w illustrations throughout, notes on sources, index; original cloth, minor browning to spine of rubbed dustjacket; bookplate, cloth bumped; otherwise a very good copy.